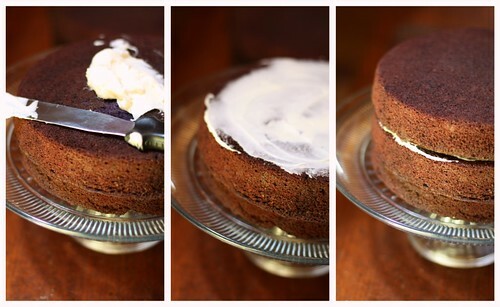 honey & jam | recipes + photos: Purple (well...brown) Velvet Cake. Today is my lovely sisters 15th birthday. I can’t believe she’s driving. It seems like just yesterday we were yelling at each other in the back seat of the car. She’s become this awesome bluegrass loving, mandolin playing, Jesus following young woman. She rocks. And how else could I celebrate but to make her a cake? She requested her favorite, Red Velvet. Since red velvet is essentially just chocolate cake dyed bright red, I thought it would be more fun to dye it purple. Sadly, it came out more brown, but it’s the thought that counts, right? than most, super moist and slightly tangy. Plus, the cream cheese frosting was delicious, and I don’t even like it normally. To top it off I used this little birdie, he was once a christmas ornament. It’s so Sarah. Happy Birthday baby sister, I hope you liked your cake! let's pretend I can actually frost cakes! haha. Adapted from “The Confetti Cakes Cookbook” by Elisa Strauss via Smitten Kitchen. Oh, for those interested, I did get a new lens! I upgraded from the 50mm 1.8 to the 50mm 1.4. So far I love it! You can see the shots I've taken so far with it at my flickr. I love your approach to frosting. I try to get it all perfect and it ends up looking stupid. Yours looks more nonchalant. Happy 15th Birthday to your sister! You did a great job on the cake! It looks beautiful! The cake looks beautiful and delicious! The ornament is such a cute touch! I don't know much about camera lenses, but I definitely can say your photography skills are great! I think brown works. It's lovely! What a sweet sister you are! You both sound like you are good friends as well. How nice is that! 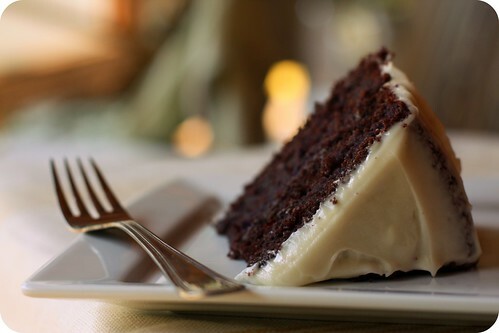 I could hug you, I'm so happy about that last picture of the frosted cake. We can be frosting friends because I have the same struggles. Your cake, though, looks SO DELICIOUS. Happy birthday, Hannah's sister! Looks like it has been good. Gorgeous cake and happy birthday to your sister. She must have loved this. I must tell you, my parents had a pair of white porcelain birds on their wedding cake - every time I see such figures as decoration, it makes me grin like crazy. Happy birthday! That looks like a GREAT cake! The frosting doesn't HAVE to be perfect, it looks all nice and home-made! :D Glad you got a new lens, I look forward to lots of nice pictures!! Oh, oh oh!!! IT LOOKS SO YUMMY! I will make you a promise - you come out to Pittsburgh to visit me and I PROMISE to teach you how to frost cakes. I love this recipe too! I found it a year or so ago and have made it numerous times. Frosting cakes are really difficult. I cannot lie and say that all my cakes come out perfectly smooth or wonderfully pretty. But it's the taste that matters!! you're photographs are ever so wonderful! lovely blog, and lovely food no doubt! I'd take "a little more chocolate-y," any day. And the bird? Adorable. It makes the cake. Beautiful photos!! i, too, thought that elise's red velvet could be modified and attempted "blue velvet" for a psu game. it looked a little sick, but tasted fantastic. If I were your sister, I couldn't ask for a finer cake! Wonderful post. Happy Birthday. You are both awesome girls. You and your sister are both beautiful!!! I hope she enjoyed her birthday and gorgeous birthday cake! Although I really love your cake and am such a foodie. I have to say my favorite pic here is the one of you smiling. Very sweet! Very nice to make a cake for your sister too. well I love the frosting. it's so rustic and truly gives off the homemade vibe--which is the type of cake that tastes best. Your photographs are wonderful! The cake looks absolutely delicious - your sister is lucky! Yes, it's the thought that counts! I liked your idea of dying it purple, though! I think there's a little too much cocoa in that recipe for the purple to show through. But very sweet of you to give it a go! I'm sure your sister loved it! what! i love this frosted cake! if you wouldn't have said anything i would have thought you meant to do it that way. Lovely cake. 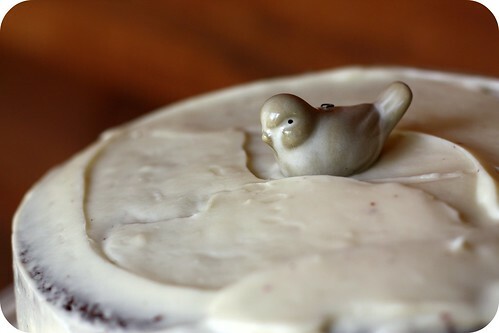 I love how you topped it with the little bird--the perfect touch. Happy b-day to your sister! Hey Hannah, you have some beautiful photos as well! I'm a sucker for baking and photography - what a good pair :) That cake looks SOOO GOOD! i love your pictures!!!! they are so amazing! 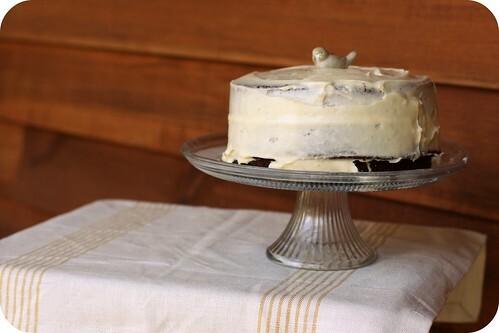 I made your cake recipe and frosting...linked to your blog. Thanks for the fun recipe!